As we are approaching the 100th anniversary of the discovery of insulin, a wide array of its signaling pathways has been defined. 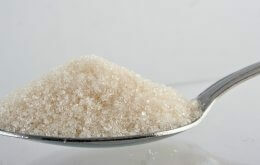 However, the initial step in insulin action, i.e. the engagement with its cell-surface receptor and the resulting conformational change, which propagates across the plasma membrane to the intracellular module, remains poorly understood. Addressing this problem, researchers from the Paul Langerhans Institute Dresden of the Helmholtz Zentrum München at the University Hospital Carl Gustav Carus of TU Dresden together with colleagues from Rockefeller University New York succeeded for the first time in the visualization of the insulin receptor activation. The results of this collaborative work have now been published in the ‘Journal of Cell Biology’. Insulin exerts multiple effects on cellular metabolism and growth. The biological actions of insulin are mediated by a cell-surface receptor, called insulin receptor, which is present on the surface, i.e. the plasma membrane, of virtually all mammalian cells. The dysfunction of insulin receptor has been linked to severe pathologies including diabetes mellitus or cancer. Insulin binds outside the cell to the extracellular domain of its receptor and induces a structural change that is propagated across the membrane to the intracellular kinase domains inside the cell, causing them to activate each other, thus initiating signaling cascades. 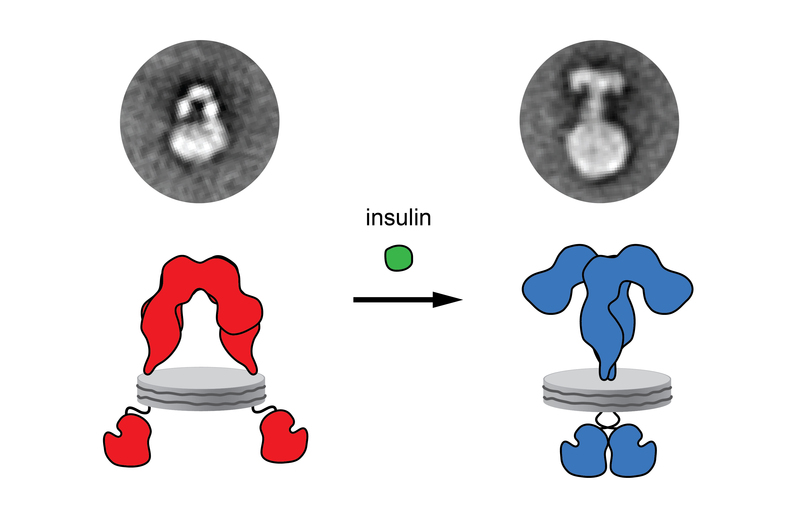 The nature of this structural change remained a mystery for decades, resulting in mutually exclusive models for insulin receptor activation being put forward. “To obtain insights into receptor activation, we purified full-length insulin receptors and embedded them into nanodiscs, which are, as their name suggests, nanoscale disc-shaped membrane patches. Those could then be directly visualized by single-particle electron microscopy,” explains Theresia Gutmann, PhD student and co-first author of the study. She works at the Institute for Pancreatic Islet Research/Paul Langerhans Institute Dresden (IPI/PLID) which is run by Helmholtz Zentrum München together with the University Hospital Carl Gustav Carus of Technical University Dresden. “This technology enables us to directly study the cell-surface receptors in an artificial membrane environment”, explains Dr. Ünal Coskun, group leader at IPI/PLID and co-senior author of the study. “In the absence of insulin, the receptor displays an inverted U-shaped ectodomain, which is consistent with previous crystallographic studies of isolated ectodomains, implying that the membrane-passing transmembrane domains and thus kinase domains are held well apart from each other.” “Upon insulin binding, the ectodomain of the receptor undergoes a dramatic reorganization, changing from a U-shaped to a T-shaped structure and also causing a rearrangement of the transmembrane domains. These now come together likely facilitating kinase domain interactions and thus their activation”, Dr. Thomas Walz, professor at the Rockefeller University, continues. Dr. Coskun summarizes: “These nanodisc-embedded receptors provide a novel platform to address further questions regarding insulin receptor regulation and eventually to test therapeutic agents.” “Our results directly demonstrate the structural transition in the full-length receptor upon insulin binding and offer an answer to the longstanding question concerning the mechanism by which insulin activates its receptor, thus improving our understanding of the receptor,” concludes Gutmann. The authors from Dresden are scientists in the German Center for Diabetes Research (DZD). The Institute for Pancreatic Islet Research (IPI) focuses on basic and clinical research on pancreatic beta cells, which are responsible for production and secretion of insulin.